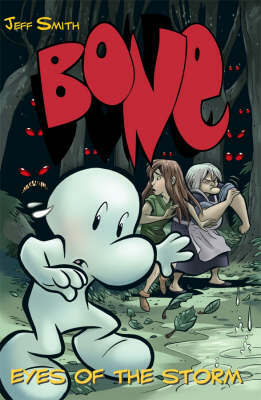 Bone has a very old soul. Its familiar tale harkens back to medieval and even Greek myth. Personally it reminds me of Peanuts whose comic characters are the perfect vehicle for imparting a great deal of wisdom about our own lives. Despite the humorous aspects of this story it now takes a turn into darker territory. Smith does a profound job of creating a looming, brooding darkness that builds at the corner of your mind and makes us fear for our beloved new world. Secrets are revealed and events are set in motion on a larger scale than just our heroes alone. Contrasting this dramatic narrative with almost Laurel and Hardy type gags is a superb choice that works wonderfully. The art is terrific and really shows off what simplicity can do. White on black night scenes which are flipped when lightning flashes are incredibly atmospheric. He also tackles a tricky extended rain scene with aplomb. Absolutely spot on. A huge Thumbs Up!